In this series, you will learn asana variations you can do every day to help ease pain and discomfort in the back and neck. 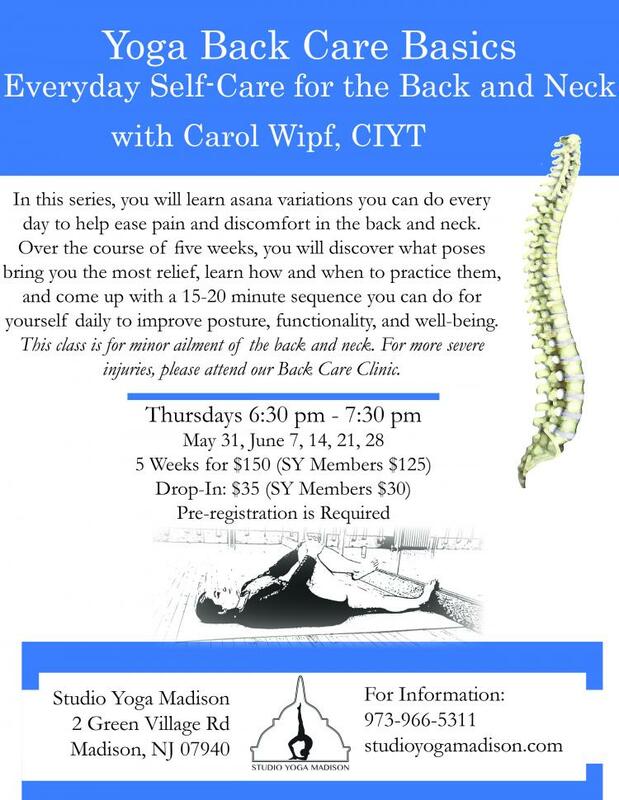 Over the course of five weeks, you will discover what poses bring you the most relief, learn how and when to practice them, and come up with a 15-20 minute sequence you can do for yourself daily to improve posture, functionality, and well-being. Studio Yoga seeks to create a caring environment and welcoming community where students can practice and grow under the guidance of expert teachers. …cultivate a lifelong practice that will help you be relaxed, centered, and joyful. Studio Yoga offers classes in: Yoga, Meditation, Pilates, Barre Sculpt, Zumba, Belly Dance, Tai Chi, Qigong, Body Work & Healing, and much more. Studio Yoga also offers: Private yoga classes, Chiropractic care, Massage, Thai body Work, Vedic astrology, Tai Chi privates, sound Healing with Himalayan singing bowls and more.